The objective of this study was to evaluate the prospective relationship between dietary acid load, assessed with both the potential renal acid load (PRAL) and the net endogenous acid production (NEAP) scores, and type 2 diabetes risk. A total of 66,485 women from the E3N-EPIC cohort were followed for incident diabetes over 14 years. PRAL and NEAP scores were derived from nutrient intakes. HRs for type 2 diabetes risk across quartiles of the baseline PRAL and NEAP scores were estimated with multivariate Cox regression models. During follow-up, 1,372 cases of incident type 2 diabetes were validated. In the overall population, the highest PRAL quartile, reflecting a greater acid-forming potential, was associated with a significant increase in type 2 diabetes risk, compared with the first quartile (HR 1.56, 95% CI 1.29, 1.90). The association was stronger among women with BMI <25 kg/m2 (HR 1.96, 95% CI 1.43, 2.69) than in overweight women (HR 1.28, 95% CI 1.00, 1.64); statistically significant trends in risk across quartiles were observed in both groups (p trend < 0.0001 and p trend = 0.03, respectively). The NEAP score provided similar findings. We have demonstrated for the first time in a large prospective study that dietary acid load was positively associated with type 2 diabetes risk, independently of other known risk factors for diabetes. Our results need to be validated in other populations, and may lead to promotion of diets with a low acid load for the prevention of diabetes. Further research is required on the underlying mechanisms. The online version of this article (doi: 10.1007/s00125-013-3100-0) contains peer-reviewed but unedited supplementary material, which is available to authorised users. A Western diet rich in animal products and other acidogenic foods can induce an acid load that is not compensated for by fruit and vegetables; this can cause chronic metabolic acidosis [1, 2]. It has recently been suggested that acid/base imbalance may play an important role in some cardiometabolic abnormalities [3, 4, 5]. Markers of diet-induced metabolic acidosis have been associated with insulin resistance, but only in cross-sectional studies [6, 7, 8], preventing any conclusions in terms of causality. Moreover, type 2 diabetes incidence and glucose intolerance have been shown to be higher in people with a lower urinary pH than in those with a higher urinary pH . Other studies that investigated the effect of an acid/base imbalance on health focused mainly on bone health, kidney stones [9, 10] and hypertension; a positive association between hypertension and acid/base imbalance was reported in the Nurses’ Health Study II , while a more recent prospective study in older Dutch adults from the Rotterdam Study failed to find any association . Two scores are commonly used to estimate dietary acid load in epidemiological studies. The potential renal acid load (PRAL) score takes into account the intestinal absorption rates of contributing nutrient ionic balances for protein, potassium, calcium and magnesium and the dissociation of phosphate at pH 7.4 [12, 13]. A negative PRAL value reflects a base (or alkaline)-forming potential, whereas a positive value reflects an acid-forming potential . Frassetto et al  developed the net endogenous acid production (NEAP) score, based on total protein and potassium intake as the main components involved in acid production; the NEAP score ranged from 34 to 76 mEq/day in a US population-based report . A Western diet has been characterised by a NEAP score of ∼50 mEq/day, although there is large variation in the general population (ranging from 10 to 150 mEq/day) [2, 14, 15]. To date, no large prospective cohort study has focused on the relationship between dietary acid load and the risk of cardiometabolic diseases. We evaluate prospectively the relation between dietary acid load, using both PRAL and NEAP scores, with the risk of type 2 diabetes in the large E3N-EPIC cohort study. The E3N study (Etude Epidémiologique auprès des femmes de la Mutuelle Générale de l’Education Nationale) is a French prospective cohort study of 98,995 female teachers, initiated in 1990. E3N is the French component of the European Prospective Investigation into Cancer and Nutrition (EPIC). Participants returned mailed questionnaires to update health-related information and newly diagnosed diseases every 2–3 years; in addition, a drug reimbursement claim database has been available since 2004, using medical insurance records (Mutuelle Générale de l’Education Nationale (MGEN)). Average follow-up response rate per questionnaire cycle is 83%, and, overall, the total loss to follow-up since 1990 is below 3%. All women signed an informed consent letter to comply with the French National Commission for Computerized Data and Individual Freedom (CNIL). Of the 98,995 women in the cohort, we excluded those who did not complete the dietary questionnaire (n = 24,466), those who did not complete any questionnaire after inclusion (n = 1,815), prevalent cases of diabetes (n = 830), those missing dates of diagnosis of diabetes (n = 58), cases with cancer or cardiovascular diseases (n = 4,011), and those with extreme (lowest and highest percentile) values for the ratio between energy intake and required energy (n = 1,330). A total of 66,485 women were included in the present analysis. Usual diet over the previous year was assessed by a validated 208-item diet-history questionnaire in 1993, structured according to the French meal pattern. Questions were asked about all times of day when food or drink was consumed, from breakfast to after-dinner snacks, thus including all food and drink intake between meals, such as appetisers before lunch or dinner. Nutrients were then estimated using a French food composition table. The validity and reproducibility of the dietary assessment questionnaire have been reported previously . Quartiles of the scores were used for statistical analysis. The algorithm used to validate diabetes cases used two steps. A first set of potential cases of diabetes included women who had self-reported diabetes, medical or dietary treatment for diabetes, or hospitalisation for diabetes in at least one of the eight questionnaires returned between 1993 and 2005. A total of 4,289 self-reported cases were identified (see electronic supplementary material [ESM] Fig. 1). Of these, 2,315 cases were considered valid because they were reimbursed for a diabetes drug at least once between 1 January 2004 (date when the file became available) and 30 June 2007 (date of endpoint in the present study). Of the 1,974 remaining cases, women alive and with an accurate address (n = 1,735) were mailed a questionnaire that included questions on diagnosis and treatment of diabetes. Among the 1,480 women who completed this questionnaire (response rate 84%), we confirmed 342 cases of elevated glucose concentration at diagnosis (fasting ≥7.0 mmol/l or random glucose ≥11.1 mmol/l), treatment with diabetes drugs, and/or fasting glucose or HbA1c ≥ 7%,(53.0 mmol/mol), respectively. A total of 2,657 self-reported diabetes cases were thus validated. A second strategy to identify diabetes cases used first information exclusively from the drug reimbursement database (n = 1,216 participants, who did not self-report any information on diabetes, and had at least one diabetes drug reimbursed). We mailed the diabetes-specific questionnaire to 1,139 of these women (alive with a valid address), and 734 completed it (response rate 64%). Cases were validated if the patient declared having diabetes and had been reimbursed for diabetes medication at least twice. Women who declared they did not have diabetes and who had been reimbursed for diabetes drugs only once before 30 June 2007 (n = 233) were considered non-cases. We validated as diabetic cases women who confirmed diabetes in the diabetes-specific questionnaire (n = 458) and those who did not answer the diabetes-specific questionnaire but had been reimbursed for diabetic drugs at least twice (n = 381). Other potential cases were considered non-validated (n = 144). Altogether, a total of 3,496 diabetes cases diagnosed before 30 June 2007 were thus validated cases with incident diabetes in the E3N-EPIC cohort. Although this procedure did not always allow differentiation between type 1 and type 2 diabetes mellitus, given the age range of our population, incident diabetes cases would almost all have been type 2 diabetes. Prevalent cases of diabetes were excluded from our study population, leaving 1,372 validated cases during the follow-up. The PRAL and NEAP scores were categorised in quartiles, with the first category as the reference group. Cox multivariate regression models, with age as the time scale, were used to estimate HRs and 95% CIs. 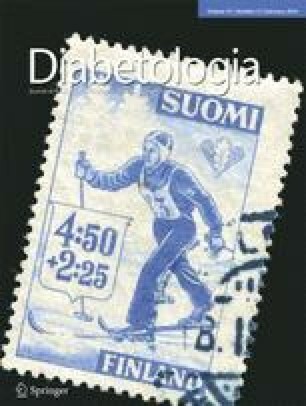 Time at entry was the age at the beginning of follow-up, and exit time was the age when participants were diagnosed with diabetes, died (dates of death were obtained from the participants’ medical insurance records), were lost to follow-up or censored at the end of the follow-up period, whichever came first. Multivariate models were adjusted for age, years of education (continuous), and, at baseline, smoking status (non-smoker/ex-smoker/current smoker), physical activity (continuous, metabolic equivalent of task [MET]-h/week), hypertension (self-reported or use of blood pressure-lowering drugs: yes, no), hypercholesterolaemia (self-reported blood cholesterol >6.2 mmol/l or use of cholesterol-lowering drugs: yes, no), family history of diabetes (yes/no), alcohol intake (continuous, g/day), omega 3 fatty acid intake (continuous, g/day), carbohydrate intake (continuous, g/day), energy from fat and protein (continuous, kJ/day), coffee (continuous, ml/day), dietary patterns (Western or healthy; for further information, please see Cottet et al ) and the following established dietary risk factors for diabetes in the E3N cohort: sugar and artificially sweetened beverages (continuous, ml/day), fruit and vegetables (continuous, g/day), processed meat consumption (continuous, g/day). Since adiposity has been found to be a key factor in the relationship between diet and type 2 diabetes and at least partly an intermediate factor, we tested multivariate models with and without BMI (continuous, kg/m2). When data were missing for fewer than 5% of adjustment variables, we replaced missing values with the median value. Tests for linear trend across quartiles of PRAL and NEAP scores were performed using the median value in each quartile. A cubic spline regression model was also computed to evaluate the shape of the relationship between the PRAL score and the risk of type 2 diabetes. The reference value for estimating HRs and 95% CIs was chosen as PRAL = −50 mEq/day, and three knots were used (PRAL = −14, −3 and 7 mEq/day, the quartiles of this score). All statistical analyses used SAS V.9.3 (SAS Institute, Cary, NC, USA; PHREG procedure for Cox models). All statistical tests were two-sided and considered to be statistically significant if p < 0.05. We stratified analyses by BMI categories (<25 vs ≥25 kg/m2) to test if associations were similar in normal-weight and overweight women. To test a reverse causation hypothesis, we also evaluated the associations between PRAL and NEAP scores with type 2 diabetes by excluding cases that occurred during the first 3 and the first 7 years of follow-up, respectively. The correlation between the PRAL and NEAP scores was high (ρ = 0.93). Therefore, we only described baseline characteristics of the study population according to the PRAL score. As shown in Table 1, women with a higher dietary acid load (higher PRAL score) were younger than women with a low dietary acid load. They were also characterised by less physical activity, fewer were treated for hypercholesterolaemia, they more often had a family history of diabetes, and they showed better adherence to a Western dietary pattern and, inversely, worse adherence to a healthy dietary pattern. Means (or frequencies) for these variables all differed significantly from each other across the PRAL quartiles—all corresponding p values were highly significant. In contrast, mean BMI (although the corresponding p value was significant) and the proportions of smokers were very similar across quartiles of the PRAL score. A diet with high acid load was associated with higher daily energy intake compared with that of women with low PRAL scores. High-PRAL diets were characterised by a lower percentage of carbohydrates, a higher percentage of fat and a higher percentage of protein (mainly driven by a higher animal protein intake) compared with low-PRAL diets. A high-PRAL score was also characterised by higher intakes of phosphorus, calcium and sodium and a lower magnesium intake. With respect to specific food groups, a high-PRAL diet included significantly more meat, fish, cheese, bread and soft drinks, particularly artificially sweetened beverages, whereas a diet with a low-PRAL score included more dairy products, fruit, vegetables and coffee (Table 1). During the 14 years of follow-up, a total of 1,372 validated cases of incident type 2 diabetes were identified. Both the PRAL and NEAP scores were associated with an increased risk of incident type 2 diabetes in age-adjusted and multivariate models (Table 2). In multivariate model M1, there was a statistically significant linear trend of increasing type 2 diabetes risk with increasing score (p trend < 0.0001) for both PRAL and NEAP scores. Women with a high acid load (PRAL > 7 mEq/day) were at a higher risk of type 2 diabetes than those with high alkaline load (PRAL < −14 mEq/day) (HR 1.71, 95% CI 1.40, 2.07). An HR of similar magnitude was observed for the NEAP score between extreme categories (HR 1.74, 95% CI 1.44, 2.11). Adjustment for BMI (multivariate model M2, Table 2) slightly attenuated the associations between PRAL (or NEAP) and type 2 diabetes risk (HR 1.56, 95% CI 1.29, 1.90 for PRAL >7 mEq/day vs PRAL < −14 mEq/day; p trend < 0.0001). We also tested an adjustment for BMI as a continuous variable and additionally including a squared term in BMI, but it did not modify the associations (data not shown). We observed a threshold effect in the relationship between PRAL score treated as a continuous variable and the risk of type 2 diabetes (Fig. 1). There was a plateau for HRs associated with negative PRAL values, while risk linearly increased with increasing PRAL when PRAL values became positive. The shape of the relationship was very similar for the NEAP score (not shown). To evaluate whether BMI could modulate the association between dietary acid load and type 2 diabetes risk, we stratified the analyses by BMI (< and ≥25 kg/m2) (Table 3). PRAL and NEAP scores were associated with higher type 2 diabetes risk in both normal-weight and overweight/obese women, but the associations were stronger in normal-weight vs overweight women: HRs associated with high-PRAL diet (PRAL >7 mEq/day) vs low-PRAL diet (PRAL < −14 mEq/day) were 1.96 (95% CI 1.43, 2.69) in normal-weight women and 1.28 (95% CI 1.00, 1.64) in overweight women. Findings were similar for NEAP scores. In order to test a reverse causation hypothesis between PRAL and NEAP scores and type 2 diabetes risk, we excluded the 188 cases that occurred during the first 3 years of follow-up, leaving 1,184 cases for analysis. For both scores, associations with type 2 diabetes were identical with those of the main analyses in terms of magnitude and statistical significance (not tabulated). For example, women with a PRAL >7 mEq/day were at a similarly increased type 2 diabetes risk compared with women with PRAL < −14 mEq/day (HR 1.72, 95% CI 1.39, 2.13, p trend < 0.001), as in the main analyses. Similar results were obtained when the first 7 years of follow-up were excluded. In this study of women with relatively alkaline diets (median PRAL = −3.0 mEq/day), a diet with a high acid load (characterised by a high PRAL or a high NEAP score) was associated with an increased risk of type 2 diabetes. Associations tended to be stronger in normal-weight women than in women with excess weight (BMI ≥25 kg/m2). To our knowledge, this is the first prospective study to evaluate the risk of type 2 diabetes associated with scores reflecting the acid load of the diet, such as PRAL or NEAP. In the Nurses’ Health Study II, a high NEAP score was found to be associated with a higher risk of hypertension , while this was not confirmed in a recent study using both the PRAL and NEAP scores . In the latter report, based on the Rotterdam Study with 2,241 participants, the multivariate HR comparing the third with the first PRAL tertile was 1.02. However, there was little variability in either the PRAL or NEAP scores, which may have limited the possibility to detect associations. Other studies that investigated the effect of an acid/base imbalance on health focused on bone and kidney stones [9, 10]. Associations between low serum bicarbonate, higher anion gap and low urine pH—all markers of metabolic acidosis—and insulin resistance have been reported [7, 19, 20]. Higher levels of serum lactate, a component of the anion gap, have been associated with a higher risk of type 2 diabetes in the ARIC cohort . A recent prospective study showed that higher plasma bicarbonate levels correlated with a lower odds of incident type 2 diabetes among women in the Nurses’ Health Study . Type 2 diabetes incidence and glucose intolerance have been shown to be much higher in people with a lower urinary pH than in normal volunteers . Although the associations were slightly attenuated when adjusted for BMI, high PRAL and NEAP scores remained strongly associated with an increased risk of type 2 diabetes. Thus it is unlikely that the association between acid load and type 2 diabetes risk is strongly mediated by adiposity. Moreover, associations were slightly stronger in normal-weight than overweight women. Consequently, our results seem to be largely independent of adiposity. The association between dietary acid load and cardiometabolic diseases has been little studied, and few mechanisms have been proposed to explain the potential harmfulness of an acidogenic diet on these diseases. A diet rich in animal protein may favour net acid intake, while most fruits and vegetables constitute base precursors. In our study, the fact that the association between both PRAL and NEAP scores and the risk of incident type 2 diabetes persisted after adjustment for dietary patterns, meat consumption and intake of fruit, vegetables, coffee and sweetened beverages suggests that dietary acids may play a specific role in promoting the development of type 2 diabetes, irrespective of the foods or drinks that provide the acidic or alkaline components. A recent review suggested that imbalances in acid/base homeostasis may play an important role in some cardiometabolic abnormalities : an acidogenic diet may cause chronic metabolic acidosis over time, which may then lead to insulin resistance and the metabolic syndrome. This mechanism was supported by cross-sectional studies showing that a high dietary acid load was associated with insulin resistance [6, 7, 8]. Results from our prospective study are consistent with these previous findings. In addition, the induction of mild metabolic acidosis by the administration of ammonium chloride results, in humans, in reduced insulin sensitivity, as assessed by the gold standard technique, the euglycaemic clamp . Furthermore, metabolic acidosis decreases the binding of insulin to its receptors in rats, suggesting that metabolic acidosis may promote insulin resistance . Finally, in experimental studies, acid/base alterations are associated with decreased insulin secretion . This study has some limitations. Information on diet was not updated during follow-up, while dietary habits may have changed over time. Although we adjusted for most of the known and potential type 2 diabetes risk factors, residual confounding cannot be ruled out. Finally, our study population included only women. This limitation should be minor, as few studies report differences in risk factors for diabetes between men and women, and proposed biological mechanisms are similar for both sexes. This study has numerous strengths. The detailed dietary questionnaire of the E3N-EPIC cohort study enables us to characterise women with an acidogenic diet in terms of major food groups and nutrient intakes. Moreover, we analysed validated incident type 2 diabetes cases only, based on a well-defined validation algorithm, which reduces the risk of missing cases or of false positive cases. Some residual misclassification with respect to diabetes status may exist, but it is likely to be non-differential. Finally, to test a reverse causation hypothesis, the prospective design and the long follow-up in the E3N-EPIC cohort allowed us to perform sensitivity analyses, while keeping sufficient statistical power to detect associations, making the reverse causation hypothesis unlikely. This is the first prospective cohort study to show that a dietary acid load is directly associated with an increased risk of type 2 diabetes. From a public health perspective, dietary recommendations should not only incriminate specific food groups but also include recommendations on the overall quality of the diet, notably the need to maintain an adequate acid/base balance. We are indebted to all participants in the study and are grateful to the E3N-EPIC group. The study is supported by the Mutuelle Générale de l’Education Nationale, the Institut de Cancérologie Gustave Roussy, and the Institut National de la Santé et de la Recherche Médicale. The validation of potential diabetes cases was supported by the European Union (Integrated Project LSHM-CT-2006-037197 in the Framework Programme 6 of the European Community) InterAct project. Study sponsors had no role in the design of the study, the analysis or interpretation of data, the writing of the manuscript, or the decision to submit the manuscript for publication. GF and BB designed the research; GF and AV conducted the research; AV analysed data; GF, FB, ML, MCBR and BB interpreted the data; GF drafted the article, and AV, BB, ML, FB, MCBR and FCC revised it critically; FCC contributed substantially to acquisition of the data and had primary responsibility for the final content of the manuscript; all authors read and approved the final manuscript.